In November, I was fortunate to have the opportunity to visit several schools that are personalizing learning for students through blended learning models. The technology allows for a flexible environment where students can learn at their own pace and in their own way. Teachers have more time to work with individuals and small groups while other students are learning content online or working on projects. After several days of visits to schools at all levels, it become clear to our team that there isn’t one formula for success. Each school had a story to tell about how they had launched initiatives and then iterated or pivoted after getting feedback and analyzing results. The one common theme at each school was that everyone was on board with the initiative and committed to meeting the needs of all students. In an age of customization where we’ve come to expect personalized music, search results, reading lists, and even coffee, it seems likely that we would want the same personalization for our students. Moving from an Industrial Age educational model, however, requires compelling arguments to win over a diverse group of stakeholders. By identifying some of the most common arguments against blended learning, we can begin to build our argument for personalization through a blended model. “I don’t have time” is a common argument against many initiatives that schools attempt to implement. The failure of the initiative is inevitable unless you can identify what time is needed and for what purpose. Preparing for blended learning takes a lot of planning time, but implementing a blended model gives teachers extra time to work with students who need additional help. Counter this argument with “how can we not find the time to help all of our students succeed?” To be successful, leadership must work to provide up front planning time for teams of teachers. Teaming allows teachers to divide and conquer when developing online content and projects. Why not? Just because you learned it that way doesn’t mean that all of your students will benefit from the same method. Let’s look at multiplication as an example. The traditional method of rote memorization can be detrimental for students who have working memory deficits. Why not give students choice in how they become fluent with multiplication? A student with memory problems might benefit from a station rotation blended model that allows them to choose an activity like lattice multiplication to help with multiplying large numbers. Other students may benefit more from an online math activity. The “one size fits all” method has never worked in education and never will. The best way to prepare students for a test is to make learning relevant for them. A blended model allows students to learn at their own pace and in their own way. 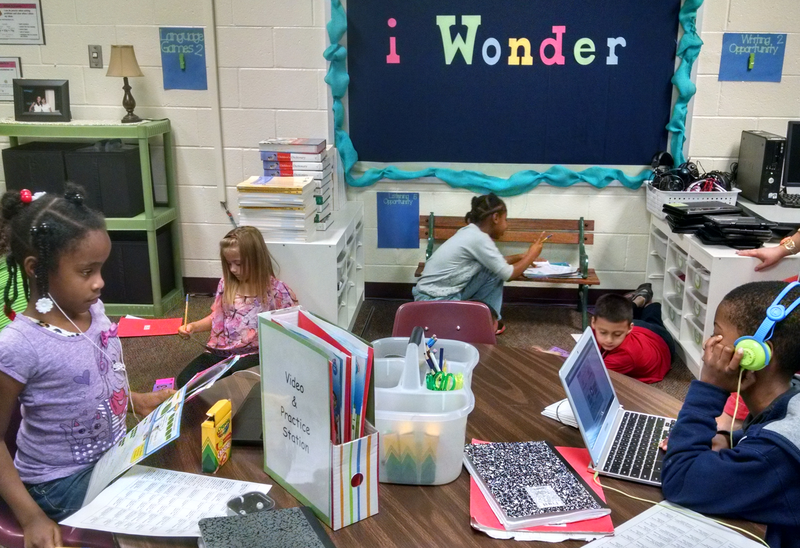 In a blended environment, students learn how they learn best and are accountable for mastery. Blended models provide students with frequent feedback from the teacher to keep them on track for learning goals. The new Common Core tests require students to learn 21st century skills. Blended learning creates an environment where communication, collaboration, critical thinking, and creation can happen. Parents who take an interest in their child’s education will be excited that the teacher now has time to work individually with their child. We can use this as an excuse or we can be proactive and have parent nights to explain the program and give students a chance to showcase their learning. Use social media to share the great things happening in your classrooms. The big change is that all students will be awake. They’ll be actively engaged in their own learning and that could involve purposeful movement. Isn’t that better than teaching to a sleeping student or a student who’s off task? Excuses are easy and will quickly derail a new initiative like blended learning. As you prepare for blended learning in your school, be aware of potential arguments against change and move forward by setting the conditions for success with a diverse group of stakeholders. Gaining support for your initiative is the key.